The sun is shining, the birds are singing… and your hair is fried. While summer has many beauty benefits (hello, dewy skin), your hair can suffer from all that beach and pool action. Get the upper hand by learning what the worst stresses are, and how to beat them. 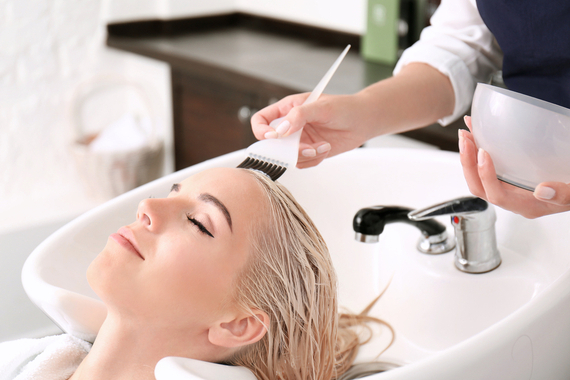 Chlorine is a wonder when it comes to killing harmful bacteria, but it can also be pretty successful at killing your hair. Frequent swimming in chlorinated water strips your hair of its natural oils, leading to spilt ends and breakage. As a simple defence, try wetting your hair with fresh water before you swim to reduce the amount of chlorinated water absorbed by the hair shaft. Applying an oil-based product prior to taking the plunge will also act as a protective coating. Those with colour-treated locks have an additional problem: chlorine is a bleaching agent that can cause blonde hair to turn a greenish colour and dull brunette shades. To limit the damage, try to wash your hair as soon as possible after your swim and invest in a shampoo and conditioner tailored to your colour. Consult your hairdresser if it’s too late for preventative measures – they can correct your colour with toner and trim any split ends. And don’t underestimate the effectiveness of an age-old tried-and-tested solution: a swimming cap. Like chlorine, salt has a drying effect that can lead to dull, tangled and brittle locks. Look for a pre-swim treatment, or spray leave-in conditioner to re-hydrate. The good news? Salt water can be great for scalp problems. Most of us are pretty well educated on the harmful effects of sun exposure to skin, but perhaps you should consider applying sunscreen to your hair, too. There are a number of hair products that offer SPF protection to keep your tresses shiny and healthy. These are especially useful for preserving colour-treated hair. But the best solution? A good hat. There’s science behind why summer humidity equals bad-hair days: water vapour in humid air causes hydrogen bonds to form between the proteins in your hair, making it fold back on itself (creating curls and frizz). This may mean that summer is the time to embrace a top knot or braid to keep things under control when you’re out in the elements (then let your hair down when things cool down at night), but serums and oils will help, too. Avoid shampooing every day and if you can skip the brush, do. And the top tips for maintaining year-round frizz-free locks? Book in for regular trims and conditioning treatments at your local salon, rinse your hair with cold water before you get out of the shower, and invest in a microfibre hair towel rather than rubbing it with a regular bath towel.